In my day job in the beverage industry, I help educate people about wine, spirits and drinking culture. I also spent about 2 years working at a craft beer bar and getting to know plenty of New York brewers. As a result, I can get pretty geeky about what I drink and how I drink it. So, when I saw the Fizzics Universal Beer System, a freestanding at-home draft system that claims to give bar quality pours from growlers and beer bottles alike, my interest was perked. Any home brewer or avid beer drinker I know loves a nice draft pour of their favorite suds. 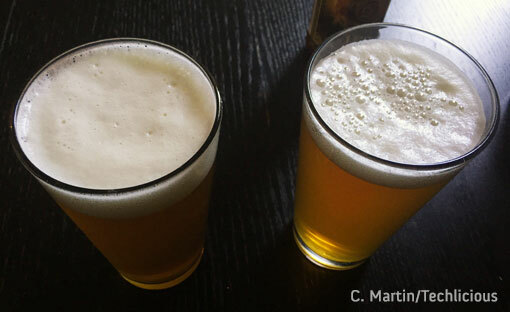 Draft is often thought of to be a better option in terms of freshness and taste when it comes to most beers. The Fizzics is attempting to offer that same quality of a pour, but in the comfort of your own home. Battery powered, (yes, that means no C02 canisters) the system is able to pressurize the beer for an even pour and then uses sound waves to create a draft quality head. But how does the drinking experience of the Fizzics poured beer compare to what you can get in a bar? Here’s what I found. The Fizzics comes with a docking platform, an anti-microbial drip mat, a canister, and a tap handle. From the box, putting the machine together is intuitive and I was done in less than a minute. The draft system is powered by 4 AA batteries, which makes it completely portable. It’s also lightweight—just 3.5 pounds—so it’s relatively easy to lug around to a BBQ or beach gathering. It’s about 18 inches tall with the tap handle on, so you’ll need to make sure whatever counter top you use has that sort of cabinet clearance. When it’s time to pour a drink, you can open any can or bottle of beer and place it in the canister. It also takes growlers up to 64oz. There’s a tube on the inside that must be guided into the opening of the beer, and then the top of the canister gets sealed shut. Pulling the tap handle forward will pressurize the canister with air and “taps” the beer. To get the head of the beer, you then have to push the lever backwards. It only takes a few seconds to get a dense top layer. This foaming action differs from other keg systems because it is not dependent on a CO2 canister or Nitrogen tank. Instead, the system uses sound waves to produce a smoother foam texture. Just like a normal keg on tap, the beer in the canister will “kick” when it gets low, meaning the system will spurt a little bit. The mess is minimal, and as the pros will tell you, a kicked beer is authentic to the draft pouring experience. The Fizzics does make a slight buzzing noise as you use the tap, but it’s nothing that a little party music can’t drown out. The tap handle attaches easily to the top of the canister, yet feels loose as you grip it. I found that it had the tendency to fall off with multiple uses and could easily get lost if used in a group environment. Clean up is a breeze. The system only requires a hand wash with warm water and is easy to disassemble for washing and drying. I would keep it out of the dishwasher as it could damage the system and also leave you with soapy flavors in your next pour of beer. generated by pouring directly from a bottle. The draft system boasts minimal foam output on the initial pouring as to conserve all the carbonation in the drink itself. As I poured through a variety of beers, I found that while the pour was smooth, I still got head on the beer even before I pushed the tap backwards for the foam top-off. In cases like the Captain Lawrence IPA, I could have done without the backwards tap completely. The front-pour foam was light, aromatic, and resembled exactly what I had gotten when ordering it at a bar. When finishing beers with the Fizzics foam, the head is much thicker than what I received from a bar tap. Its consistency settled somewhere in between a regular draft pour and a nitro pour (think Guinness.) It had a shinier appearance and a milkier viscosity. The product manual recommends filling your glass with the frontward tap to about 2/3 and then topping with about 1/3 of foam, but this was way too much head especially with the denser consistency. When I adjusted the foam to just a little over a finger’s worth in thickness, which is standard in a bar setting, it was easier to enjoy. Despite the denser and creamier consistency of the foam, the texture of the beer was spot on to how the beers tasted from a regular draft system. In both bar and home situations, the beers gave off the same amount of aromas and tasted relatively similar in terms of mouth feel. 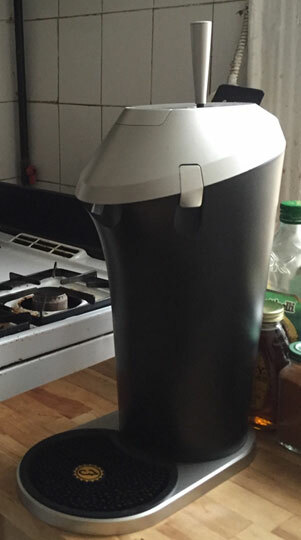 This at-home draft system claims to keep a beer cold for 12 hours on its own, and for at least 24 hours if packed with ice around it, but the canister does not appear to be insulated. When I tested the beer without the ice, it did not meet the mark. The beer was at room temperature after 12 hours. With ice, the beer kept cool for about 16 hours, but at the 24-hour mark the ice had all melted and the beer had lost its chill. It had also naturally lost a lot of its carbonation, since the bottle was open in the canister. Yet, when I poured the beer, the Fizzics still managed to give it a little head when I pushed the level backwards, which was a nice surprise. Aside from not being able to keep a beer cold on its own for the advertised period of time, the only limitation of the Fizzics is that it can only pour carbonated beers. This excludes nitro beers and other beverages like hard ciders, sparkling wines, and soft drinks. Should you want to try one of these products with the Fizzics and the system breaks, the warranty would be void. A lot of what the Fizzics stands on is that the system pours beer the way the brewer intended it to be poured, meaning from draft. And yes, it definitely gives a drinker the chance to enjoy a draft beer at home. But the foam technology produces a denser result than you'd get at a bar. By no means is it bad, and people who enjoy the creamer head of a nitro beer may even prefer it, but I have a hard time believing this is what the brew masters intended. All that being said, the Fizzics is a fun beer system that would be a conversation starter at any party. It would also be a neat gadget for any home brewer or beer enthusiast who does not want to invest in a full kegerator system, which can retail around $500. I won’t say it’s a must have, but it’s definitely a cool novelty item that gives a nice pour and is easy to use.